Meeting point: parking lot at highway exit ROVERETO SUD at 09.00 a.m. or in your hotel - ROCK CLIMBING lesson with our mountain guides in suitable crag; we teach different climbing techniques for example: chimney, cracks, slabs; different knots, belaying, rope and via carabiner set techniques. Departure from the hotel at 08.30 a.m. - Via ferrata "Colodri" Arco (easy) and other "Rio Sallagoni" (difficult) to Castel Drena, two short routes short but significant for the didactic of our courses. The total duration of the day is about six hours. Departure from the hotel at 08.30 a.m. - Climbing "Fausto Susatti" on Cima Capi and following the route "Folletti" under the control of our mountain guides. It is a ring-route on equipped trails easy and very panoramic (is directly above Lake Garda) duration of 5/6 hours. rucksack - water - sandwich - light windcheater - preferably trekking boots - gloves - hat/cap - sunglasses - suncream. helmet, harness, carabine-set, nclimbing shoes (only 1st. 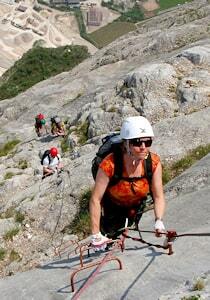 day), rope, carabiners, etc., will be provided by the mountain guide and is included in the price. The booking should be made by e-mail at least 20 days prior to the start of the course to uide@alpinguide.com. A deposit payment should made in the amount of EUR 150,00 and the balance must be paid on the first day of activity. It is a mountain route which is equipped with fixed cables, stemples, ladders, and bridges. The use of these allows otherwise isolated routes to be joined to create longer routes which are accessible to people with a wide range of climbing abilities. Walkers and climbers can follow the equipped trails without needing to use their own ropes and belays, and without the risks associated with unprotected scrambling and climbing. They are found in a number of European countries, and a few places in the United States, Canada and Malaysia. The first via ferrata were built in the Trentino Dolomites mountain region of Italy Alps during the First World War to aid the movement of mountain infantry. The world's highest via ferrata, at 3.800 metres, is located at Mount Kinabalu in the state of Sabah, Malaysia. 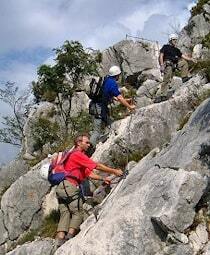 Via ferrata are graded according to their difficulty. Grade one usually involves nothing more than an assisted walk. Grade five demands serious climbing skills. For any route, other than the easiest, climbers are advised to wear special via ferrata set which is designed to cope with the particular requirements of the ways. The Dolomites are divided into two main regions. To the west are the Brenta Dolomites. This has many excellent routes, particularly around the town of Madonna di Campiglio. The famous Sentiero Bocchette Alte and the Bocchette Centrali can both be reached by lifts from Madonna di Campiglio. The greater part of the Dolomites, and most of the equipped trails, lie to the West, in the Brenta Group. Probably the most unusual via ferrata in the eastern part of the Dolomites is via ferrata of Lagazuoi Tunnels. Fighting for control of Mount Lagazuoi in WW I, Austrian and Italian troops built a series of tunnels through the mountains. The aim of each side was to tunnel close to the enemy and detonate explosives to destroy their fortifications. Some of the tunnels have been restored, with a equipped trail following the route of one of these. It is now possible to descend into the mountain by following the Lagazuoi Tunnels route. The most popular route in the Dolomites is believed to be Ivano Dibona, involving a traverse of the main Monte Cristallo ridge. The complete route takes about eight hours. The day starts at the base of the Rio Gere lift system with a ride on two lifts to reach the Lorenzi Rifugio at 2950 metres. The traverse starts at this point, trends mostly downhill, and passes several WW I fortifications. The route Bolver-Lugli (constructed in 1970 by mountain guides from San Martino di Castrozza) takes climbers of the Cimon della Pala at a height of 3,184 metres. While via ferrata is similar to rock climbing the major difference is that the fall factor, which in climbing can never by definition exceed 2, on via ferrata can be much higher. These high factors are possible because the length of rope between harness and carabiner is short and fixed while the distance the climber can fall depends on the gaps between anchor points on the safety cable. The human body, as well as most items of climbing equipment cannot withstand the forces associated with some of these higher fall factors and so a number of devices have been developed to act as shock absorbers or progressive brakes. Their function is to dissipate the energy of the fall while at the same time keeping the climber and equipment intact. However, in spite of the perception as being more secure and safe than rock climbing, people are more likely to injure themselves if they do fall, partly because of these elevated fall factors and partly because there are often rungs, steps, and rocks etc on which to land. Those who climb on a equipped trails are advis to use normal climbing equipment (harness, helmet, appropriate shoes etc), in addition to the necessary carabiner kit which consists of two short lengths of rope or webbing linked in Y formation to the harness by means of a braking device with a carabiner at the end of each line. There are two types of brake: the first uses a metal plate or moulding through which a rope is passed providing a high degree of resistance; the second employs stitching which progressively tears in case of a fall, providing a gradual slow down. A metal plate brake allows the climber to rethread the rope in case of a fall allowing them to have some degree of protection while completing the climb. With a stitch brake, on the other hand, the system may be so lengthened after a fall as to be unusable, but it is easy to verify that the device has been deployed. This is important because all these devices are certified for only one fall, after which they must be replaced. Organisations lending or hiring such devices must therefore be able to guarantee that they are not re-used after such an incident. Another advantage of the stitch brake is that the braking system cannot easily be disabled by an inexperienced climber, as can inadvertently occur with friction plate systems. In the latter, a length of the rope which passes through the plate hangs loosely from the plate while in use, so as to be available to be drawn through the plate if high fall forces occur. Carabiners are also made specially, their design typically allowing a larger than normal opening and having a spring locking mechanism that can be opened with one hand. They are also strong enough to withstand high fall factors. Such carabiners are marked with a K in a circle, the K standing for Klettersteige. These are the only types of carabiner that should be used on the end of the safety lines. A typical design uses a spring-loaded sleeve on the carabiner gate. While the gate is closed, the sleeve is held in place over the gate opening by its spring; to unlock and open the gate, the sleeve slides directly down the gate shaft away from the opening. With its constant clipping and unclipping, but not for applications where more secure locking mechanisms are required. In addition, locking sleeves on carabiners have been known to hang up in the gate opening and prevent the gate from closing properly.